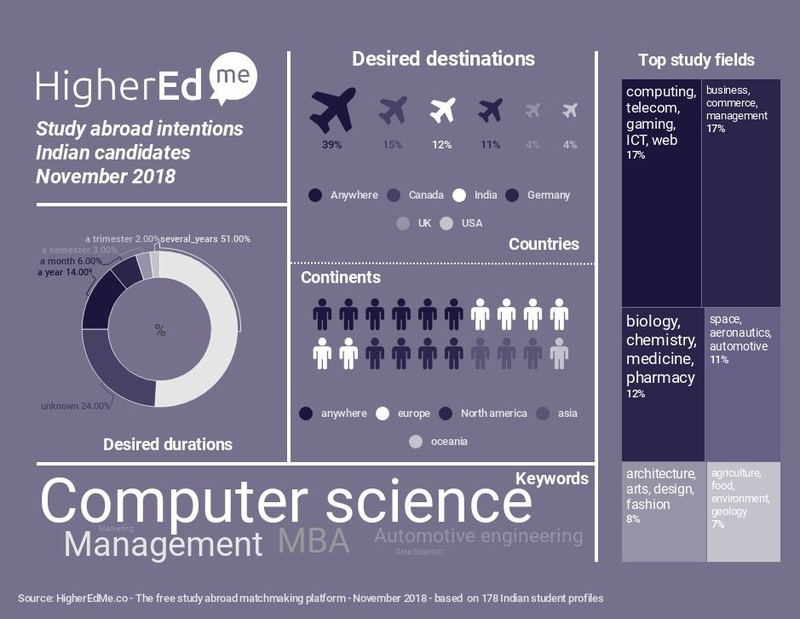 To create our insights, HigherEdMe collects study abroad projects from international candidates continuously by making digital campaigns on social media. When reaching a hundred of student profiles in a specific area, we design a document about where study abroad candidates want to go and the desired duration of stay, what they want to study in terms of specific keywords and domain trends. Understanding what international student candidates want is a key parameter that counts in the internationalization process of higher education institutions. HigherEdMe is here to help. Our infographics are built with the latest data we collect thanks to our free matchmaking platform. It enables international student recruitment and marketing teams to align with candidates demand, to give feedback to their program designers and to decide where to invest their digital campaigns budget. It also helps country developers to better understand how the market shifts. Our platform is open to any university that needs to get in touch with international student candidates. It is also a way to perform its own insights by exploring their profiles. Feel free to sign-up and create your fresh view of the current study abroad demand, by country of origin or by study field. You are creating an international student recruitment strategy and you need to check your country priorities? HigherEdMe can assist you to analyse the domestic demand in terms of study field, budget, duration and keyword requests. We will confirm if your choices are aligned with the market. Contact us to receive a tailor-made offer from our sales team.